Ideal for girls or boys, this new baby gift set features some adorable newborn layette essentials in a decorative gift box. Unlike cheap imports, these layette items are all premium grade and made here in the USA using only the finest domestically grown cotton. Each includes colorful embroidery and is sure to be soft on baby�s skin. 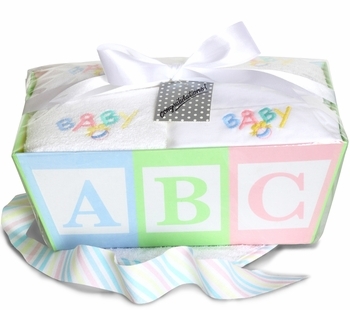 The decorated ABC gift box can be used as a cute container to help organize baby�s wares in the nursery.